The Speech Team at Big Bronx! The team won 5th in sweepstakes. The Policy Team at the Georgetown Day School Invitational. They absolutely dominated. The Public Forum Team at the Yale Invitational. The Speech and Debate team outside of the Duncan Hotel at the 2017 Yale Invitational. 2017 Speech & Debate Senior Cake! Dinner after day three at Emory! The team ended the year with a bang, and we're starting off the New Year with some great successes. Our Varsity debaters flew to Minneapolis in December and were greeted with minus 30 degree temperatures. All the students who attended the tournament advanced to the elimination rounds. Great job guys. 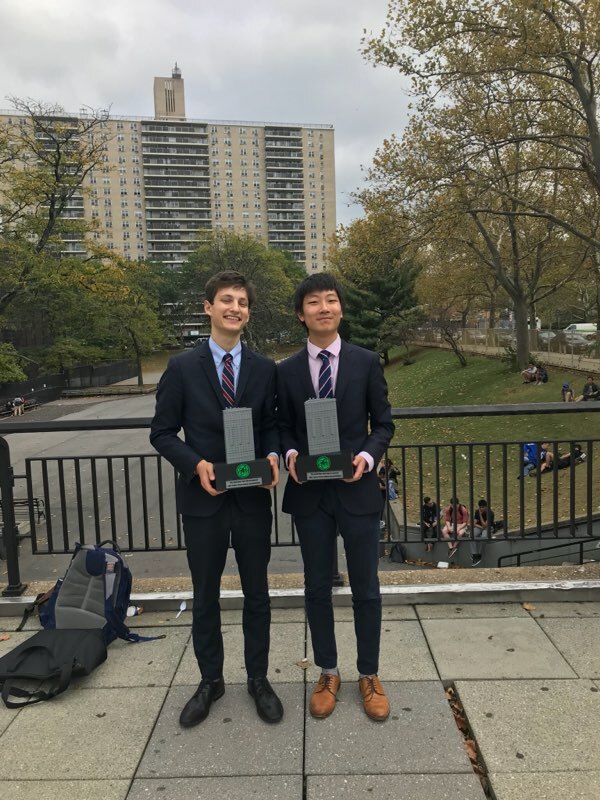 And while the Varsity was "freezing their cases off" in Minnesota, the JV debaters spent a great day at Stuyvesant (with 500 other debaters.) We hosted a CFL/UDL tournament with students from all over the city and Westchester. Our PFers, LDers and Policy Teams had a great time and home court advantage! As soon as the New Year began, the team resumed its competitive schedule. 50 speech and Congress students trekked out to Mineola LI in the snow bringing back lots of finalists from Chaminade, including the Dou Champions Liam Elkind and Kate Johnston. The newly formed Parliamentary Team competed at Dalton 22 strong. These contests took place on Jan 7. Meanwhile...back at the ranch our varsity LD team went to Newark HS in New Jersey. Katherine Fennell, our LD captain was invited to the Round Robin there. She is considered on of the finest LDers in the country. This week (14th) 50 debaters will head off to Lexington, Mass while 50 speakers and Congress students will compete at Regis. Coming up are Columbia, Emory and of course, Harvard. 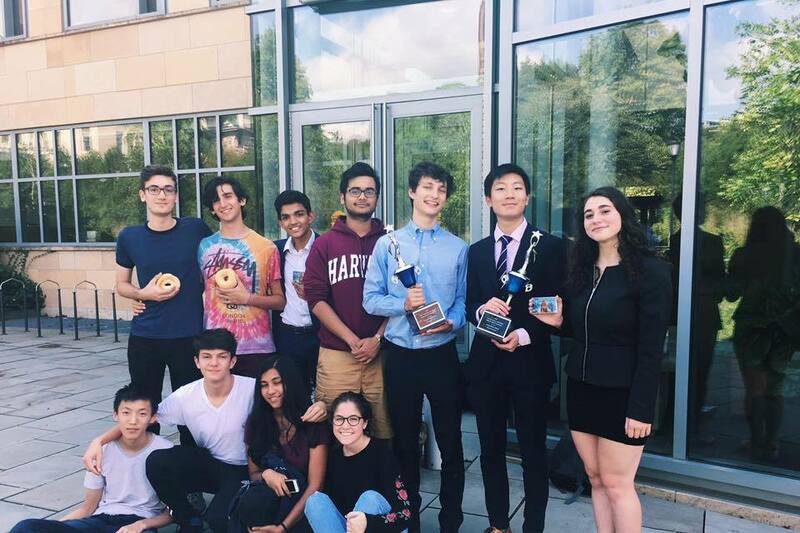 I am proud to report that our PF team Abie Rohrig and Zachary Ginsberg have been invited to the very prestigious Harvard Round Robin. Currently, they are ranked #2 in the USA. Katherine Fennell will be representing us at the LD Round Robin. So we are off to a great start. We still need lots of support to get our team to Harvard, so if you can help, please click on our gofundme link HERE. No amount is too small. Our Public Forum team at Blake! Our Lincoln Douglas team at Blake! Jenny Han, her partner, was 2nd Speaker! Way to go girls! Our Lincoln Douglas team at the Newark Invitational!